Citroen will give a world premiere to their flagship C5 Aircross SUV at the Paris motor show next month. It will sit on their stand alongside key models such as new C4 Cactus and new C3 Aircross. The is the first stage of the brand’s energy transition offensive, leading to 100 percent of the range having an electric option with the Paris motor show heralding Citroen’s hybrid plug-in offensive. Citroen tells us that the new look of their brand will enable it to build on recent successes. In the first half of 2018, it achieved growth of nine percent globally. In Europe, the brand recorded its highest level of sales for seven years and grew its market share in both passenger and commercial vehicle sectors. It added that these results highlight the success of Citroen’s recent launches, C3, new C4 Cactus and new C3 Aircross Compact SUV in Europe and the new C5 Aircross SUV in China. It claims that this dynamic is supported by the comprehensive renewal of the brand itself, adding that it is inspired by customers and their automotive experiences. The new C5 Aircross SUV is manufactured in France and will be on display complete with the ‘Origine France Garantie’ (Guaranteed French Origin ) label that was presented during the summer. The SUV will be shown in three different configurations to promote its full comfort and personalisation potential. Citroen says that the new C5 Aircross SUV stands apart through its singular, energetic and assertive attitude. Measuring 4.50m long, robust and muscular, the new model stands out in the SUV segment with its strong graphic details, such as the Airbump panels, large 720mm-diameter wheels, ground clearance of 230mm and distinctive roof bars. 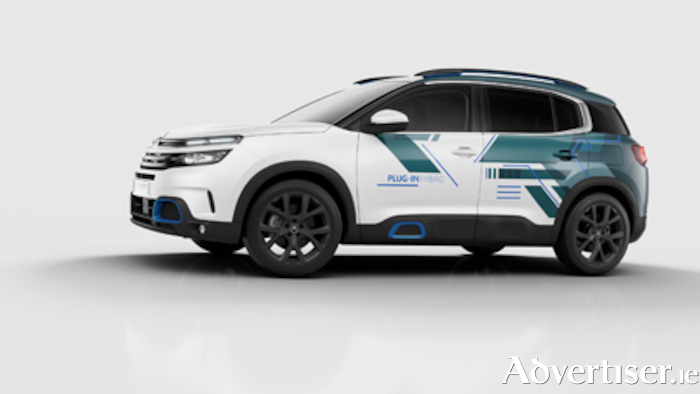 The innovative French carmaker claims that the passenger compartment instantly gives an impression of protection and spaciousness, with a horizontal dashboard and enveloping seats. It adds that the high driving position gives the feeling of dominating the road, whilst the wide central console and warm materials provide a welcoming space. Similar to their latest models, the new C5 Aircross has a broad range of personalisation features with 30 possible combinations available for the exterior. Seven body colours, a black two-tone roof and three ‘colour packs’ are available. The colour packs comprise coloured inserts on the front bumper, the Airbump panels on the lower parts of the front doors and on the roof bars. The new SUV also comes with five interior ambiances. The matching colours offer a trendy and premium ‘casual chic’ style. Citroen also describes the new C5 Aircross SUV as an ambassador for their ‘advanced comfort’ programme, featuring two major innovations, their Progressive Hydraulic Cushions (PHC ) suspension and Advanced Comfort seats. These technologies claim to filter out road imperfections and offer outstanding ride comfort for everyone on-board. Citroen boasts that new C5 Aircross delivers unique modularity in the segment, due to their expertise in the world of MPVs, with three individual, sliding, folding and reclining rear seats and best-in-class boot volume of 580-litres increasing to 720-litres.